Every Android user downloads apps from Play Store. How will you feel if I say that you can earn some dollars for just downloading apps? No doubt you will feel top of the town. You just need to download some amazing apps and then you can make money easily and redeem it. Isn't it sounds good when you are paid to just download some apps? Everyone wants to earn some extra bucks if the task is simple to do. And you know it very well how easy it is to download apps from play store. Our lives have been smarter with the usage of smartphones and smarter applications in our daily life. Here's an exciting mobile application called "Tap Cash Rewards- Make Money" using it you can earn some money. 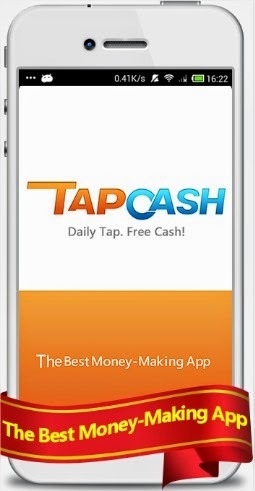 Tap Cash allows you to earn some bucks as you will download and use the applications from it. We use many different types of applications in our daily life. Daily thousand of apps are downloaded from Play Store. Some of them are games, some related to fitness, some of them are services like alarm clock, flash light etc. All of them have become our daily life usage. If we are paid to download these types of apps then there is not any problem. Tap Cash is an easy-to-use app that will earn you rewards or real cash rewards. You just need to open Tap Cash to download great games/apps/offers and then you can make money easily. If you think that you will be rich or will able to earn huge amount of money then this app is not for you. You will just able to earn some decent amount of money. One can get some extra bucks from this app. Tap Cash Credits can be redeemed for gift and even PayPal cash rewards. 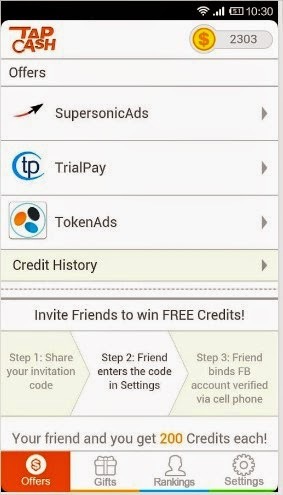 How To Earn Through Tap Cash? Simply Go to the app store and download the Tap Cash app or click here to download. Now you just need to open the Tap Cash app to download some amazing games such as Temple Run, Cut The Rope, Subway Surfers or some cool apps such as Flipkart, Jabong, Snapdeal, Myntra or any other application available in the Tap Cash to earn real cash or rewards. • Android powered Smartphone which let you access Play Store. Here I am providing a complete step by step process to earn rewards and redeem it as real cash. Once you will get the required target points you can redeem it as gift cards or may use PayPal for some real cash. 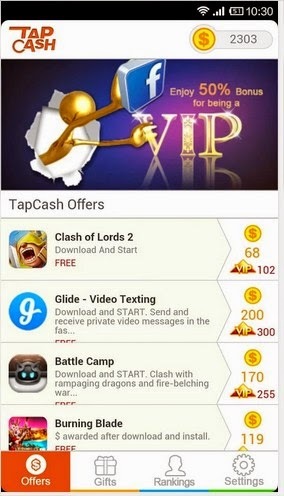 Step 1: Go to Play Store and download Tap Cash on your Android powered Smartphone. Note:- You will need high speed internet to operate Tap Cash. If it's not opening try to upgrade your internet plan to 3G. Step 2: Enter invitation code 3871986 to get 200 Free Credits Instantly! Step 3: Install Tap Cash after downloading Tap Cash. 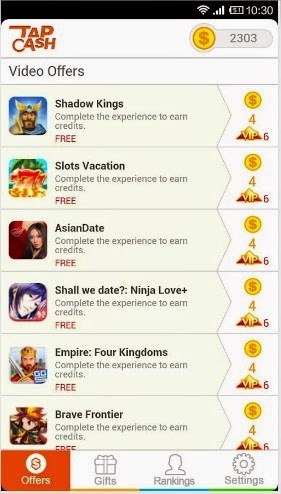 Step 4: Here you will find a complete list of games, applications and offers to earn some points. Step 5: To get the cash rewards install and run apps which you would like to download. You can also complete some other offers like watching videos or ads. 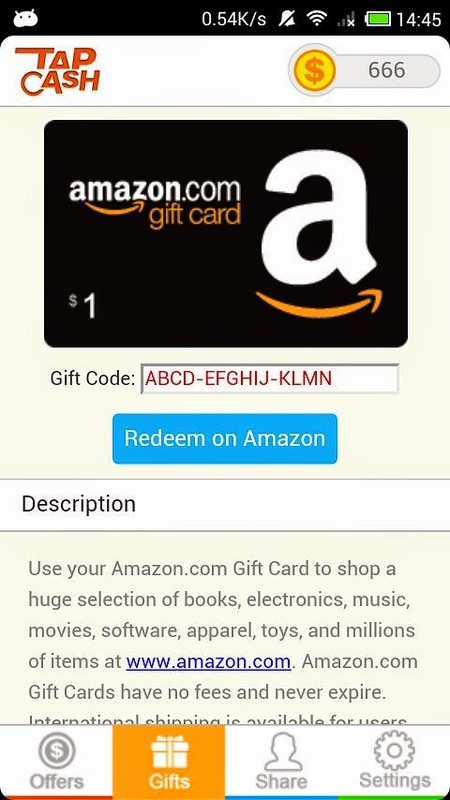 Step 6: After installing the apps you can redeem your cash rewards as gift cards or as real cash from PayPal. You can enjoy 100% VIP Bonus. To avail Bonus offer just verify your Facebook account through mobile phone and bind it with Tap Cash to get it. • Tap "Bind Facebook Account" to bind Facebook account with Tap Cash. • Tap "Become VIP" to verify account through mobile phone. • Restart Tap Cash and become a VIP. Note:- If your Facebook account has been verified through mobile phone, you will become a VIP directly after Binding your Facebook account. Thanks Rahul, I just got 1000. Wondering you would get probably 200 too. Amazing tutorial. I don't know about Send fax via online. Thanks to share it.